Opens up through two wide front leaves with acatures facade, punctuated by words on the sideboard, and equipped with hinged joints. 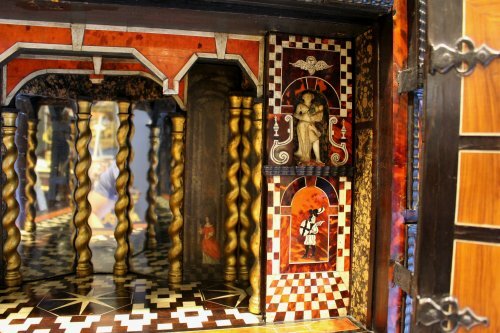 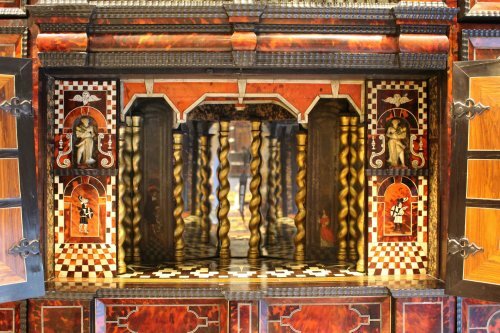 It presents a "theatre with a completely curved mirror, adorned with twisted columns and decorated with the painted figures of noblemen. 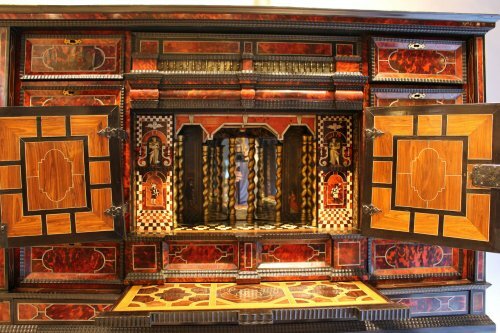 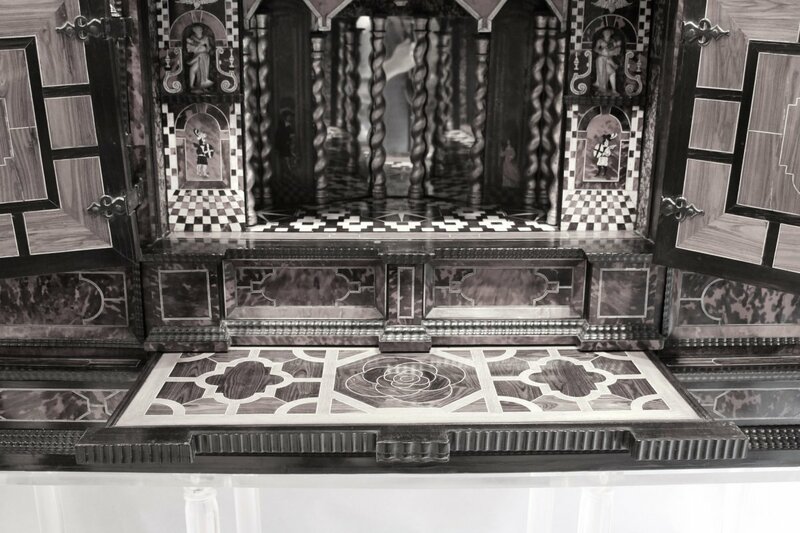 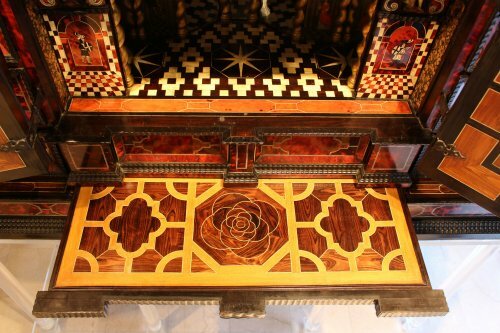 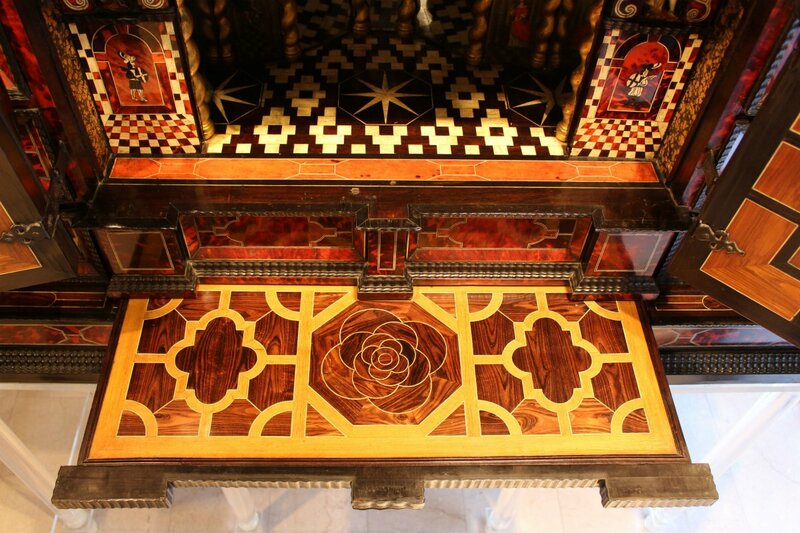 It is flanked by two removable panels with inlaid Moorish warriors and finished off with allegories in alabaster (it is rare to have the original of the above-mentioned); four double-bottom drawers on each side. 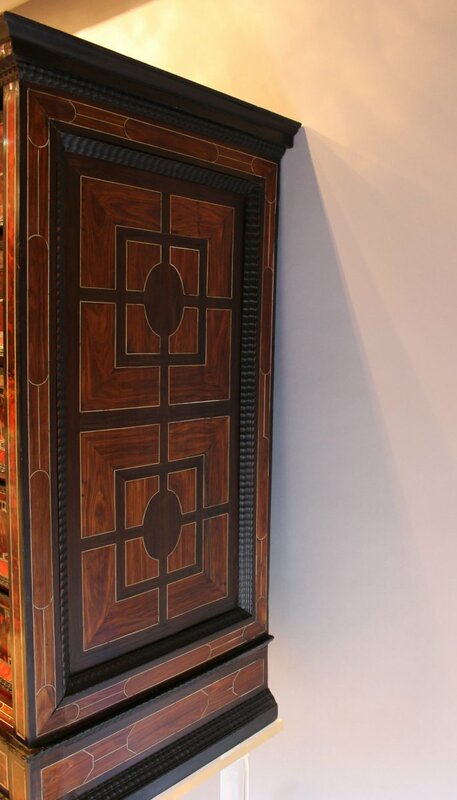 Wooden tinted and ivory tinted parquet floor centered in a rosette. 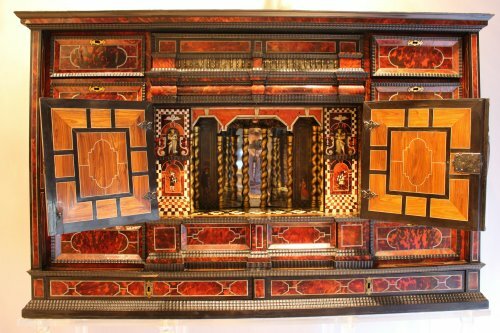 A writing tablet retractable into a belt-like structure with geometric decoration in the inlaid content in the center of a rose. 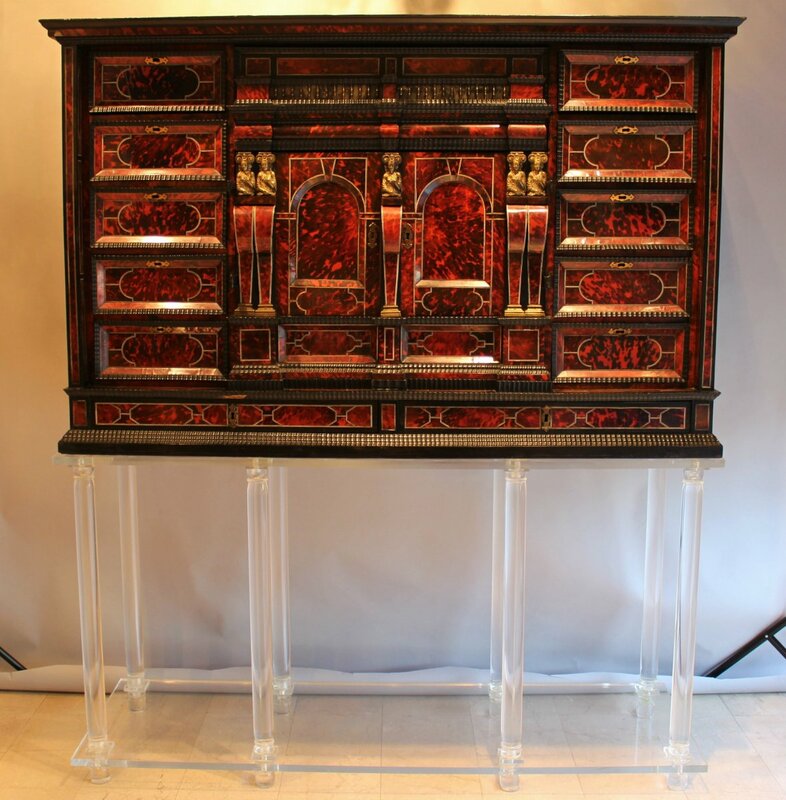 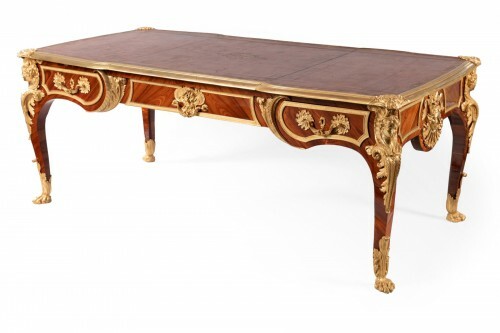 It is surmounted by two large drawers and five drawers on each side, in guillochées molding frames. 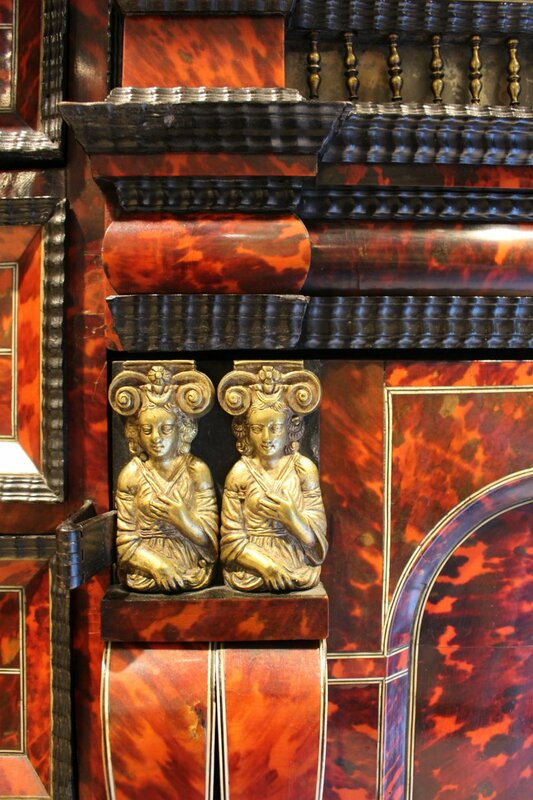 A secret drawer overlooking the arcature central door panels, adorned with balusters at the bottom of mirrors. 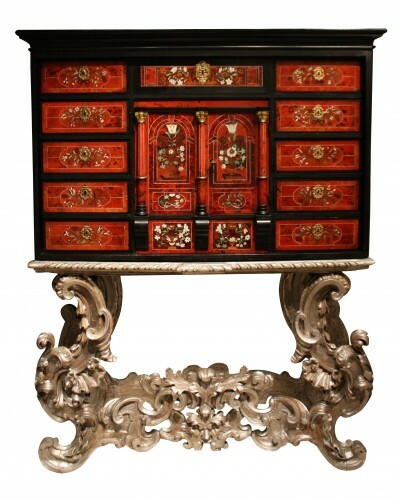 Two large drawers in the lower part. 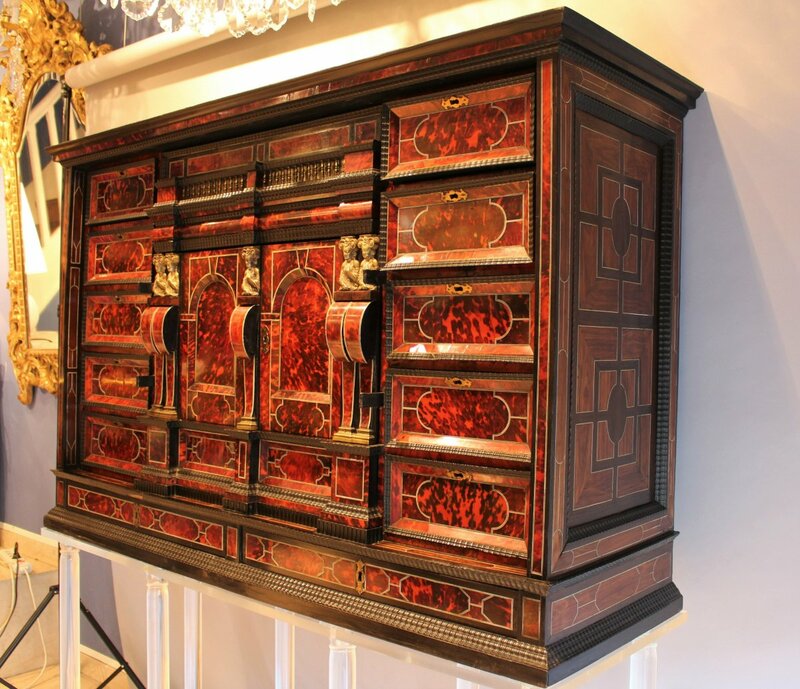 The cabinet has undergone some minor restorations, but it is in an exceptionally well-preserved state. 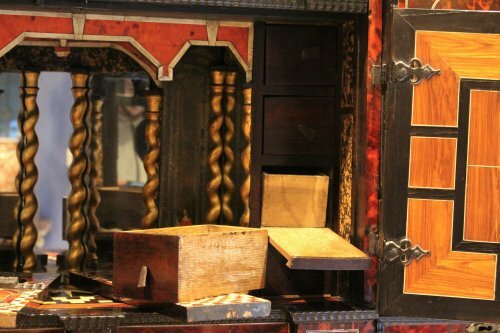 Europe opens up to the world, riches and curiosities are revealed, the larger dwellings abound with tables, wardrobes and other extravagant seats. 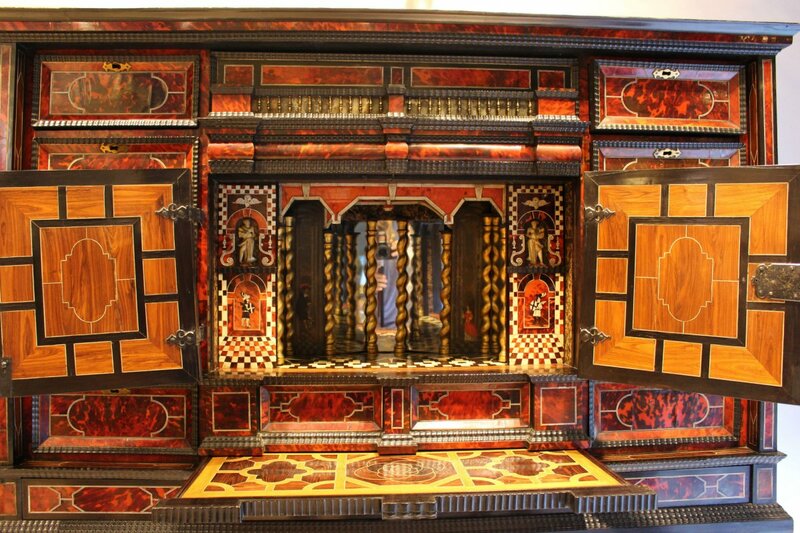 However, in the 17th century, a piece of furniture that symbolized prosperity, intellectual and scientific research was: the cabinet. 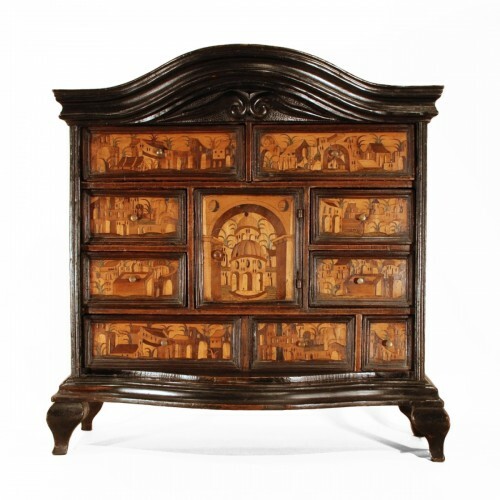 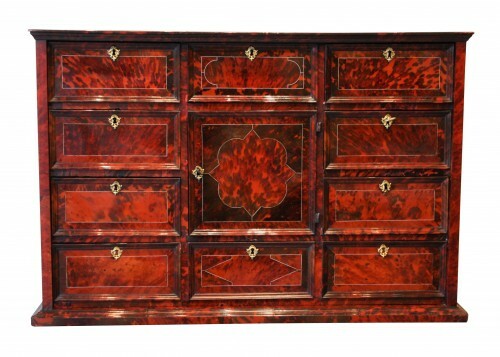 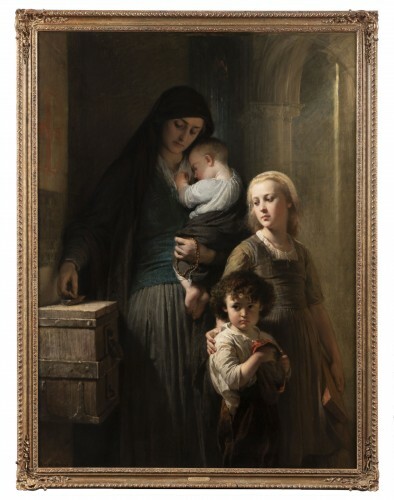 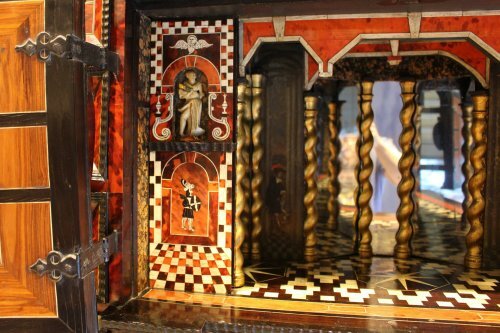 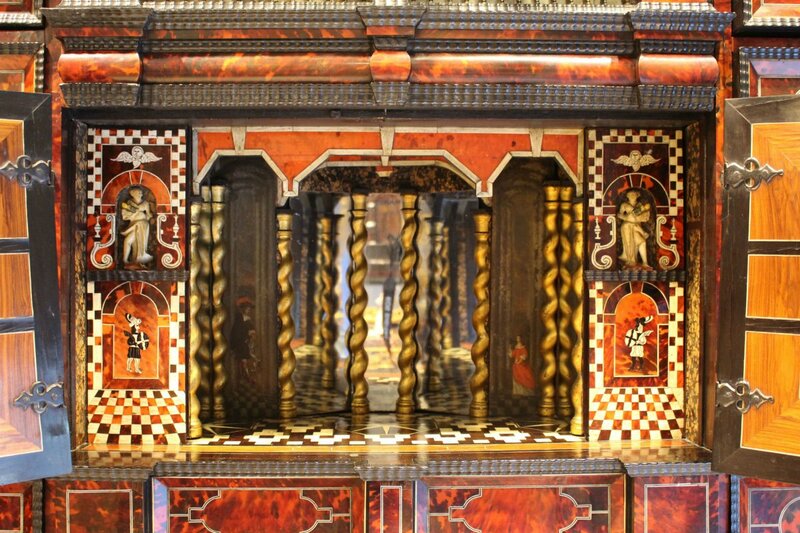 While preserving the architecture of the cabinets of the Middle Ages, it is innovating because of the lavish veneers on the frame, notably ebony and tortoiseshell. 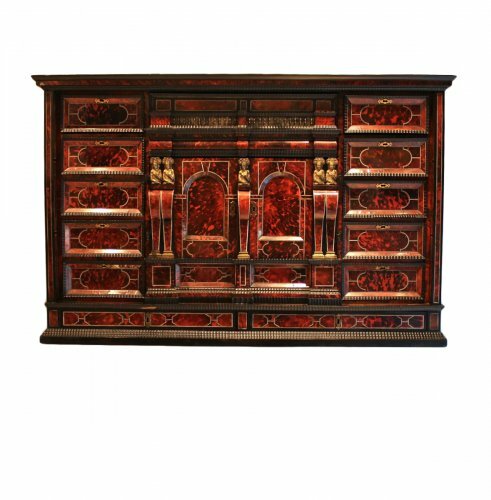 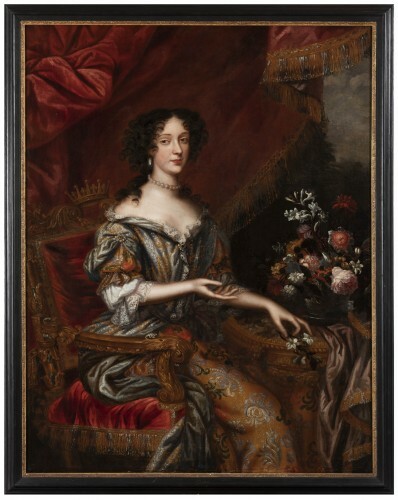 On the old engravings depicting the interiors, one sometimes views them as aligned, but always demonstrating rare pieces, such as jewelry, Chinese porcelains, shells ... This is the most important piece of furniture that nobleman could own, even naming the room from where they reign as such, the cabinet of curiosities. 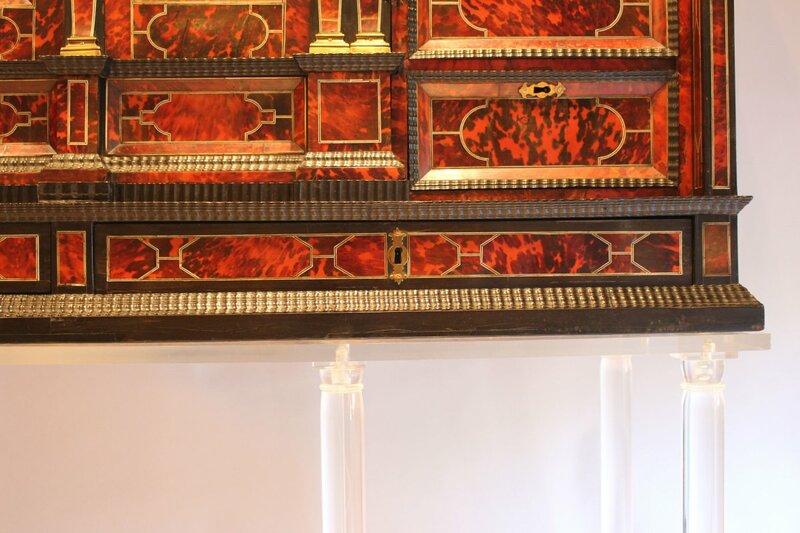 The legs of the cabinets date back to the 18th Century, in the 17th Century they were placed on an item of furniture (console, desk table). 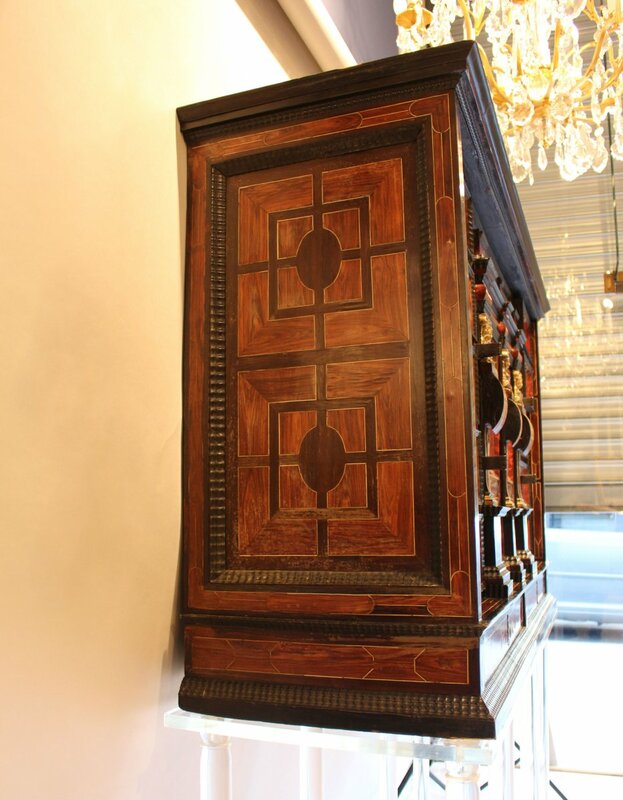 We present our cabinet with an altuglas base, because of the enhancements made to it, but also because it is a great mixture of the old and the modern. 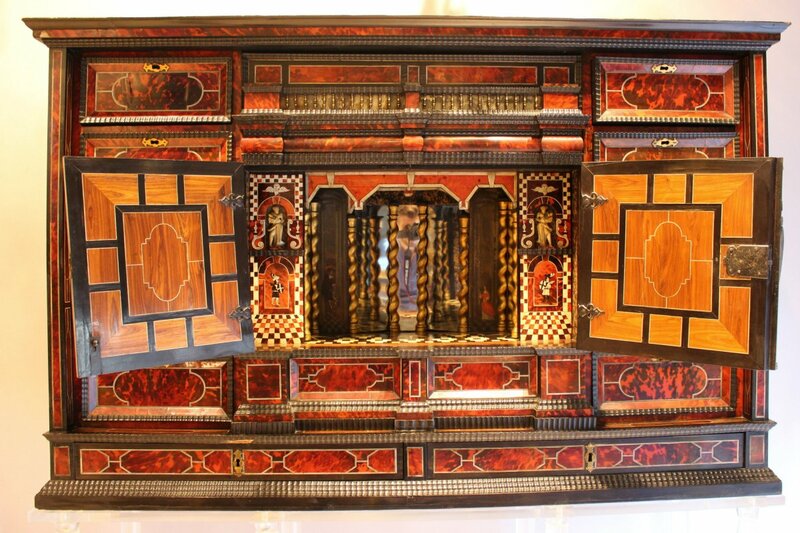 Specimen of sea turtle shells (Cheloniidae spp) (I / A-EC) pre-convention, prior to 1 June 1947, thereby conforming to Regulation EC 338/97 of 09/12/1996 art.2-W mc, In conformity with the French Environmental Code (prior to the application of the AM for the protection of marine turtles). 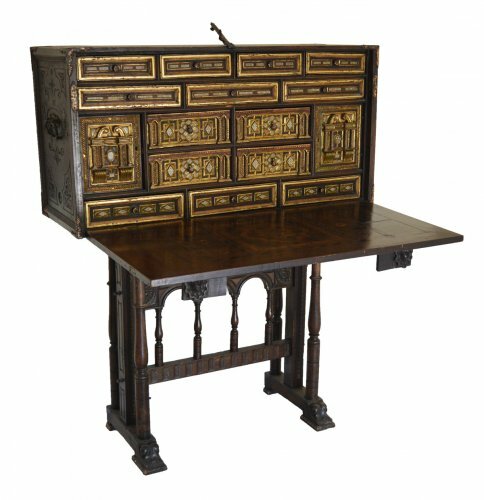 For a EU exit, a CITES re-export will be required.